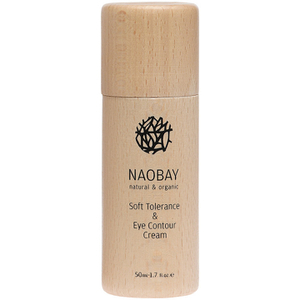 NAOBAY (Natural And Organic Beauty And You) present the Soft Tolerance and Eye Contour Cream; a fresh, fluid formula that works to soothe and comfort skin. Catering specifically for sensitive skin, the cream delivers powerful antioxidant action and protects from free radical damage thanks to its high concentration of Resveratrol, whilst extracts of Gotu Kola and Chamomile reduce irritation caused by environmental aggressors. The eye area is calmed, hydrated and restored. 98.86% of the total ingredients are of natural origin. Aqua (Water), Caprylic/Capric Triglyceride, Aloe Barbadensis Leaf Juice*, Methyl Glucose Sesquistearate, Propanediol, Persea Gratissima Oil*, Glycerin, Pichia/Resveratrol Ferment Extract, Stearyl Alcohol, Glyceryl Stearate SE Benzyl Alcohol, Dehydroacetic Acid, Centella Asiatica (Pennywort) Extract*, Chamomille Recutita (Matricaria) Flower Extract*, Potassium Sorbate, Sodium Benzoate.